Ron Goninan became a formal student and disciple 学生 of Shifu Gu-Ping 師父谷平 of Guangdong Province China in 2000, a relationship that continues to this day. 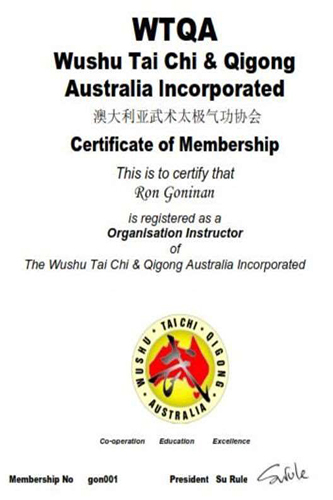 Ron Goninan is recognised as a Shifu 師父 Instructor 10th Level (Duanwei 十段位) of White Crane Wuyi / Wushu by the China Martial Arts Association of China. The China Martial Arts Association China. Government University Beijing and China Government Central Party Academy and China Government University in Beijing consists of Grandmaster Mu Xian Jie, President Zhan Shan, Grandmaster He Fu Sheng, Grandmaster Liu Wan Fu, Grandmaster Wang Feng Zhu, Grandmaster Professor Dr. Gu Ping. 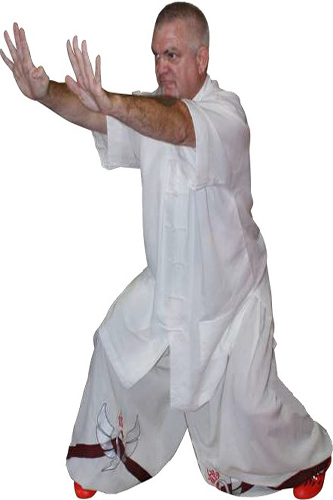 In February 2000 Ron Goninan found and linked up with Great Master Ruǎn Dōng 阮东 of Fuzhou Calling White Crane with Shifu Dong agreeing to become the Patron and Technical Master/Advisor to Goninan and the White Crane Research Institute until his sad death on July 8th 2010. In what is the pinnacle of achievements for Goninan, he was recognized as Grandmaster 9th Duan Wei 九段位 by the Examination Jury of the World Organisation Of Wushu Kung Fu Masters at a special ceremony held in Hong Kong China February 2012. This Jury consisted of 12 Grandmasters including Grandmaster Chan Sai Chung, Grandmaster Lee Kam Wing, Grandmaster Xui In, Grandmaster Liang Wei Cai, Grandmaster Lee Yoon Tim, Grandmaster He Hailin, Grandmaster Xie Yanshun, Grandmaster Yang Shunde and Grandmaster Wu Bin 吳彬 who is responsible for producing some of China’s most prodigious Masters including Martial Arts and Action Movie Star Jet Li (“Fearless”, “The Expendables 1 & 2” etc). Certificates of Recognition for the teaching of the Chinese White Crane & Snake Crane Wing Chun from Master Yung of the Snake Crane Wing Chun Yung Kwok Athletic Association of Hong Kong China. In March,2016,Shifu Ron Goninan becomes one member of International Kungfu Federation ( IKFF ) .